Most of the information presented so far in this chapter has been pretty generic. You could apply it to virtually any open-source UNIX project. Here's where we tie it all together, adding the GNOME side of things. GNOME is a very complicated environment by itself; furthermore, all of it sits on top of the X Window System and the GIMP Toolkit (GTK+), each one of which is complex enough to leave your head spinning for weeks. Any measures we can take to ease the confusion and make our software more stable and easier to compile will pay off many times over in the long run. To this end, GNOME supplies quite a few m4 macros that you can use with autoconf. They all fit nicely in your configure.in file, although in some cases you must be careful of the order in which you call them. In particular, the AC_PROG_CC macro must be called before any macros that compile test programs to check for features. This command makes the m4 files in the macros directory available to the autoconf system. If you forget to add it, aclocal won't pull those macros into aclocal.m4, autoconf will fail to expand them, and configure will bail out when it hits the raw, nonexpanded macros because the bash shell does not understand what you mean when you tell it to run the GNOME_INIT command. This brings us to one of the most fundamental GNOME macros: GNOME_INIT. GNOME_INIT sets up the compile environment for GNOME, including a host of AC_SUBST macros for such variables as GNOME_LIBS, GNOMEUI_LIBS, GNOME_LIBDIR, and GNOME_INCLUDEDIR. It also tests for the gnome-config script (see Section 3.5.2). For a full accounting, take a look at gnome-common/macros/gnome.m4. GNOME relies a lot on the X Window System. Most of the X-specific checks you'll need are covered by the GNOME_X_CHECKS macro. This macro takes care of searching for GTK+, by internally using the AM_PATH_GTK macro (which, incidentally, is installed by GTK+). It also checks for X11 session management, the xpm library, and the pthread library. The only real difference among the three settings is the variety of -W flags added to the CFLAGS and CXXFLAGS variables. After you have configure.in set up, the next logical step is creating the makefile. Nothing in GNOME mandates that you should use automake to generate your makefiles (or even autoconf to set up your configure script). These tools make it much easier to set up a project, but they are still a convenience, not a requirement. If you do decide you want to write all your makefiles by hand, or if you want to compile a single test file from the command line, you will prob- ably want to use the gnome-config tool to keep your compiler options consistent and accurate. You can also use it in your Makefile.am files, although as we'll see in Section 3.5.3, this isn't usually necessary because GNOME takes the liberty of setting up some makefile variables for you. Notice the special back-ticks around the command (commonly found in the upper left-hand corner of the keyboard, on the same key as the tilde, ~), as opposed to the normal single quotation marks (usually found on the same key as the double quotation mark). The back-ticks instruct a shell to execute the contents they delineate and use the results of that command instead of the text of the command. This is known as a command expansion. When you use back-ticks inside a makefile, the command will not be expanded until make fires off a shell to execute a rule that references it. make blindly passes it on to the shell, unaware that the back-ticks mean anything special. Thus you should depend on the expanded form of back-ticks only within the context of makefile rules. In the example just given, if gnome-libs were installed to /usr/local, the $(GNOME_INCLUDE_DIR) variable would resolve to /usr/local/include when it was used in a make rule, but it would still contain the contents `gnome-config --includedir` anytime it was referenced inside the makefile. If you're using autoconf and automake and you've included the GNOME_INIT macro in your configure.in file, things will be even easier for you. The $(GNOME_CONFIG) variable will be available to your Makefile.am files, and you should use that instead of calling gnome-config directly. In most cases, however, you shouldn't need to invoke gnome-config at all. GNOME_INIT defines some helpful makefile variables on the basis of some commonly used invocations of gnome-config, including the imaginary $gnome_include_dir variable we introduced here. We'll go into these variables in more detail in Section 3.5.3. The gnome-config script also lets you poll various GNOME library modules for information about such things as version numbers, compile-time flags, and link-time flags. gnome-config addresses two types of modules: core modules that are integrated directly into the gnome-config script, and external modules that gnome-config dynamically detects during runtime. You can get a list of both types of modules by running gnome-config --help at the command line. The core libraries are listed in the "Known values for LIBRARY" section of the output; the external modules come at the very end of the help message. Listing 3.7 shows one possible listing of the options for a typical gnome-libs installation. --version     output gnome version information. --modversion  output the module version information. If for some reason you need to separate the library objects (-l) from the library paths (-L), you can use the --libs-only-l and --libs-only-L options instead. GTK+ does not share a version number with gnome-libs. If you want to find out the version number of GTK+ or GLib, you should call gtk-config or glib-config directly. If you want to know the version of gnome-libs itself, you should use --version instead of --modversion. The gnome-config script is a very handy interface for retrieving package information and compile parameters. It is fairly consistent, but not always so. You should always test your invocation syntax on the command line before putting it into a makefile, and be prepared for gnome-config's behavior to change in subtle ways between major releases of gnome-libs. As if gnome-config didn't already make life easy enough, the GNOME_INIT macro in gnome.m4 defines a handful of shrink-wrapped variables that you can use in your Makefile.am files without any other preparation on your part, aside from including GNOME_INIT in your configure.in file. You can probably get a good idea of what each variable is useful for, just by looking at the gnome-config command for each one. We'll see how and where to use them in Makefile.am files in Section 3.5.5. If you're interested in digging around behind the scenes to see how all the various options are generated and where the contents come from, take a look at the gnome-config.in file in the gnome-libs package. As we saw in the libtool example in Section 3.4.3, all these tools can lead to quite a long series of command invocations, each of which needs to be called in the right order, with the right parameters. Developers have enough tech support problems that result from buggy code without worrying about debugging the install process for each new user that comes along. To cut down on this excess traffic, and to make it easier for themselves, the GNOME developers created a template build script, called autogen.sh, to make sure everything is called in the right order. Also, it's simply more convenient to have to run only one command. The master autogen.sh script resides in the macros directory with the GNOME m4 files. Each distribution typically has a thin wrapper autogen.sh script in the top-level directory, next to the configure.in file. In this wrapper script you can add some additional checks before calling the master autogen.sh. Most wrapper scripts look something like Listing 3.8.
echo " top-level gnome directory"
The master autogen.sh script does various things. It checks for the existence of the autoconf and automake tools-although it doesn't specifically check the current version of them, so an out-of-date version of autoconf or automake can still cause problems-as well as the GNU gettext library. It then embarks on a recursive search, starting with the top-level directory, looking for all configure.in files in the package. It does this in case you have multiple subprojects in your distribution. Normally you'll have only one configure.in file, in the top directory, but just in case, autogen.sh checks for more. This check is necessary because you must run autoconf separately on each configure.in file. If you run autoconf on only the top-level directory, the sublevel configure.in files will end up being ignored. The autogen.sh script makes good use of grep, on each iteration looking in your configure.in file for certain macros and responding accordingly. For example, if it finds AM_GNU_GETTEXT or AM_GNOME_GETTEXT, it will run gettextize to set things up for internationalization (see Section 4.6). If autogen.sh spies an AM_PROG_LIBTOOL macro, it will run libtoolize for you. If it sees AM_CONFIG_HEADER, it will run autoheader. Next it runs automake and autoconf, with the proper parameters. Finally, it runs configure for you, passing along any parameters you gave to autogen.sh. To top things off, it adds a message to remind you that you still have to run make. This is a good example of clever build scripting. Take a look at the master version of autogen.sh when you have a chance. We've covered quite a lot of ground in this chapter. The GNOME build environment is extremely complex and covers many different strata, including over a dozen scripts of various types. It is time now to tie everything together and see if we can come up with a few practical test cases that you can use in your own development efforts. We won't change much of the original grump example. First we'll split grump.c into two separate files, one for each function. This is important for the fourth build case, in which we create two libraries, one from each file, grump.c and grump_more.c. We'll also change the #include statement in grump.h to pull in gnome.h rather than stdlib.h (this works because gnome.h in turn includes stdlib.h). Finally, to make use of gnome.h we will change our printf( ) statements to g_print( ) statements. Technically, since g_print( ) is part of GLib, not gnome-libs, we aren't really making good use of gnome.h, but for purposes of demonstration, g_print( ) is fine. You can use the same techniques to set up most, if not all, of your full-blooded GNOME applications. Listings 3.9 through 3.12 contain the source code for the four files in our example. Listing 3.13 contains our configure.in file. These five files will remain the same throughout all four cases; only the Makefile.am files will change. In case 1, whose Makefile.am is outlined in Listing 3.14, we'll link all three .c files directly into the grumpalot executable. We'll pass GNOME's compile flags to gcc in automake's global $(INCLUDES) variable. automake will add the contents of $(INCLUDES) to the compile line for every .c file we list in that Makefile.am file. We want our final executable target, grumpalot, to be installed in $(bindir), so we'll assign it to bin_PROGRAMS. Finally, we'll list the source files under the _SOURCES primary, and the flags we want to send to the linker in the _LDADD primary. This command will place the grumpalot executable file in the /home/jsheets/wga/bin directory, any libraries in /home/jsheets/wga/lib, and any include files in /home/jsheets/wga/include. When you're done experimenting, you can run make uninstall or rm -rf /home/jsheets/wga. Listing 3.15 shows the Makefile.am file for case 2, in which we want to link the two grump source files into a library, then statically link that library into grumpalot. Although this may at first seem a little silly-why don't we just compile them into the executable like we did in case 1?-you may someday have to do this in your own project. If you have a lot of files in your project, you might want to divide some of them up into separate directories to keep things organized and reduce the clutter. We name libGrump.la explicitly, without the implicit -l flag, so that the linker will not mistakenly try to link against libGrump.so. We don't have to do anything else to set up the static link. The linker will link libGrump.la into our binary file. 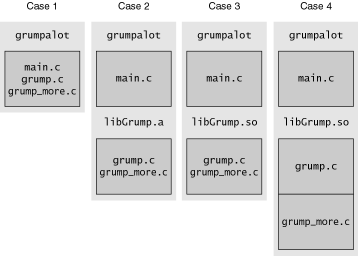 Our case 2 grumpalot program won't require any external libraries. automake knows this because we told it to use the noinst target for the library; consequently, the generated makefile will not bother generating any dynamic .so libraries. With case 3, we create a dynamic library rather than a static one. This brings up a handful of new concerns. We now have to install the library, since the executable loads it during runtime. We also have to install any header files that define the library's interface. If we didn't install the headers, other people would be unable to use our library because they wouldn't know which functions it contained; more to the point, the compiler needs the header file to satisfy the #include "grump.h" statement in main.c (or it would if the grump library were distributed separately from the main executable). Finally, we should set the library version number as we discussed in Section 3.4.5 to make sure the loader grabs the right library. This is a simple matter of adding the -version-info option to libGrump_la_LDFLAGS. See Listing 3.16 for the case 3 Makefile.am file. We provide this as a relative path off of $(top_builddir) so that make can find the .libs directory even if administrators perform their builds in directories outside of the source tree. This makes it possible to build more than one set of executables with different configure options, simultaneously, off of the same source tree. If you use relative paths inside your source tree, or mistakenly use $(top_srcdir), to refer to your object and library files, you will break this functionality. The linker will end up looking for your object files inside the source tree rather than inside your build tree, where they will reside. The dynamically linked grumpalot executable should now reside inside the build directory. If you wanted to test a static build of grumpalot without pulverizing the current dynamic build, you could create a new directory- buildstatic, for example-and then invoke configure from there, with the --disable-shared option. Presto! You now have two copies of grumpalot on your system-one that dynamically links to libGrump.so, and one that is statically linked to libGrump.a-and both of them arise from the same Makefile.am. This is only a problem if you try running grumpalot from inside the build tree, prior to installing it. If you've already installed grump with the make install target, things should work fine, as long as you installed it into a path that your system's dynamic link loader knows. automake would see to it that the corresponding directories were created and that the include files ended up in the proper install location. Our final case is a combination of cases 2 and 3, in which we have both static and dynamic libaries in the same project. The case 4 Makefile.am file has the same structure as the one in case 3, except for a few additions (see Listing 3.17). Most notably, we must add a noinst_LTLIBRARIES target to build a new static library from the grump_more.c source file. We'll call this new library libGrumpMore.la. The _SOURCES and _LIBADD primaries for libGrumpMore.la are almost identical to the ones we used for the static library in case 2, except that we are linking only one source file into it. The library targets will need a little work to convert them from case 3 to case 4, but not much. First we remove grump_more.c from libGrump_la_SOURCES, since it now resides in the libGrumpMore.la library. Next we add libGrumpMore.la to libGrump_la_LIBADD, just as we added the static libGrump.la to grump_LDADD in case 2. As a result, the linker will statically link libGrumpMore.la into libGrump.la so that we end up with only one distributable library. The _DEPENDENCIES primary simply adds its contents to the list of dependencies for the libGrump.la target in the makefile, forcing make to build our libGrumpMore.la file first.